When my son was born in 2009 I, like any proud birder parent worth their salt, had grand ambitions about making him my own image. Kids are great if for no other reason then, to quote the greatest philosopher of our time, Homer Simpson, “you can teach them to hate the things you hate”. The other side of the coin, of course, is that you can ideally teach them to love the things you love too, which for me begins and ends with birding. My own interest in birds was first sated by my own dad, who wasn’t a birder so much as an all-around naturalist who wasn’t averse to birds. When I finally discovered the feathered set, he was all too happy to be my cheaffeaur and birding companion. But I didn’t really get into birds until I was at at the ripe old age of 12 or so. That’s way too late! So since Noah was born, within his first week of life, I’ve taken him outdoors to see stuff. In the beginning this was pretty easy because strapping him into a backpack carrier and heading out to the local patch was just the thing to induce a long morning nap. But now that he’s well into 3, and privy to all the hyperactive curiosity that entails, things have gotten a little more difficult and I’ve come to some conclusions about whether or not my early start will pay dividends in the way I had hoped. Dad, I can’t see it. Where is it, dad? 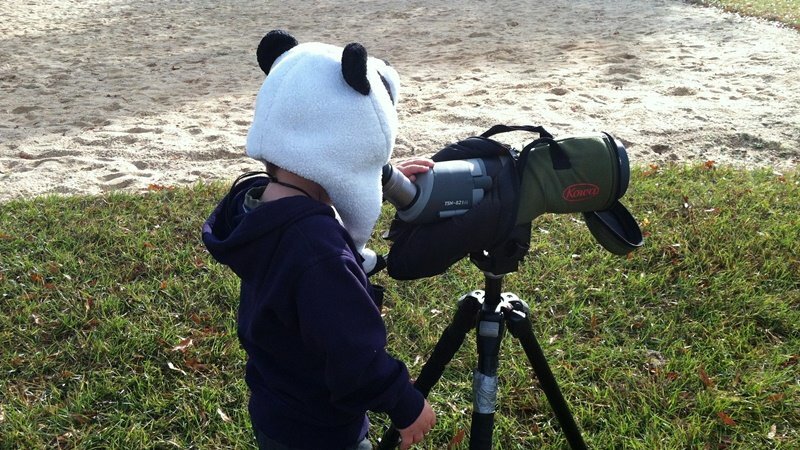 I’ve met children of birders who are extremely serious and sharp young birders and naturalists. I’ve also met children of birders who are not at all interested in the game. Both sets came from parents who have done precisely what I’m doing, with precisely the same diligence, care, and frankly, the same impulse to turn their progeny into allies as I have. I have come to the conclusion that it matters less what the birder parent does and more as to the disposition of the child. I don’t think there’s really any way to make my son a birder simply by exposing him to what I do and think about, but nor do I think I’m going to completely turn him off by my single-minded obsession either. I will say this, though. I learned quickly that birds are often way too difficult to get my son on with any regularity in the field. He does have a remarkable eye for bugs though, and I’m really enjoyed broadening my own natural horizons by trying to identify the things he finds on a scale that might as well have been invisible to me before. And snakes, turtles, lizards, and frogs are always big winners because I can catch them and show them to him. When I think back to my own natural beginnings, it was focusing on things on my level that made me eventually turn to birds. So who knows, maybe he’ll get there. These things take time after all. But I do have another trick in my pocket. 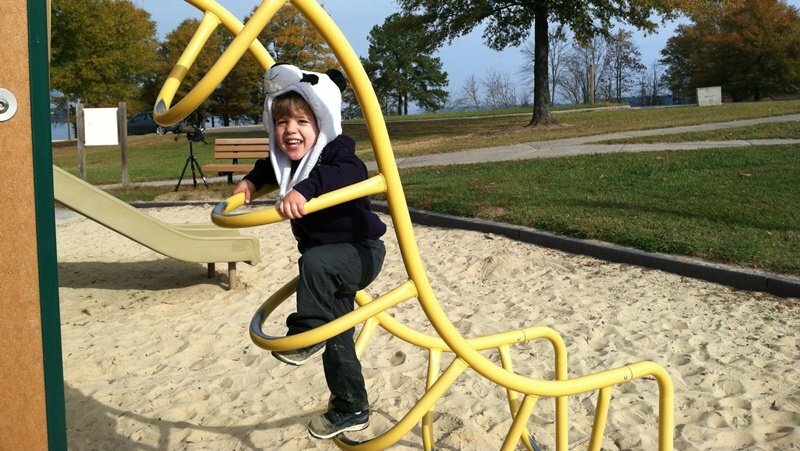 When I bird with him, we stick strictly to parks that have playgrounds. So at the very least, I can park myself on a bench with a view of a lake, and my son can do whatever it is he does when the birding slows down. Because birding should be fun, whether you’re actually birding or not. I’ve noticed that my 11 year old son will engage in birding if I let him use the BirdLog app to enter the sightings, or other apps to look up birds, or if I let him use the dSLR camera. My two younger daughters seemed to love using the spotting scope to look at all the ducks and geese on a local pond. Kids like to spend time with their parents, but we can’t force them to like what we like. I am convinced that there is something in nature that will open the key to the heart and mind of every human being, we just may have to help them find that one thing. Sounds like it is possible that he might instead be a budding entomologist or herpetologist! @Robert – Interesting. birding through gadgetry. We’re not quite there yet. @Lindsey – I would take it! I agree that children are either born with a predisposition to explore the outdoors or they are not. This is based on my experience with my young nephews, a year apart, who live in bird heaven, aka, Florida. One gets it, the other doesn’t. It’s just how they came into this world! What I love is that everyone here, reading and writing about birds on this blog and the Internet, are giving kids the opportunity to be into nature. That is the real important thing. Especially, I think, for girls. I wish I had had that when I was growing up. Everyone thought I was weird because I liked to walk in the woods and pick up shells from the beach. Hunting introduced species for food – ethical eating?